My husband LOVES Sweet Potatoes and he was so happy to find these on the table when he came home from work. I’ve been trying new ways to cook sweet potatoes and these are by far my favorite! After they are done boiling, let them cool and then peel them. Preheat oven to 400 degrees. Cut the potatoes lengthwise and then slice crosswise 1/2 inch thick. Put half of the cut potatoes on the bottom of a 9×13 pan. Place 2 Tablespoons of butter, 2 Tablespoons of brown sugar, and 1/3 of the pecan pieces over the first layer of sweet potatoes. Repeat and layer the rest of your sweet potatoes, butter, brown sugar and pecans. Bake for 15-20 minutes. Let cool a little before serving! 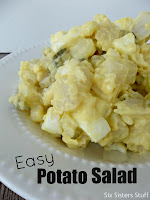 Looking for other delicious side dishes? These ones are delicious! My husband would be ecstatic to see this on the table. Going to have to try soon! Yumm!! 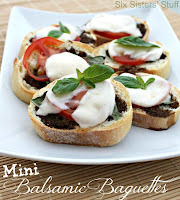 !I like the simplicity of this recipe and not too sweet! Thanks! 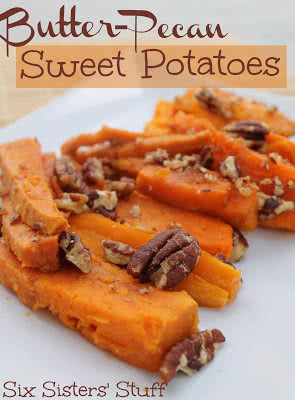 Ilove sweet potatoes this sound delicious.